It is finally here – a car we’ve been waiting a long time for. Last night the wraps were taken off the Cadillac ATS at the College for Creative Studies in Detroit. The ATS is a hugely important product for the Cadillac brand in many ways. It is the first product aimed squarely at the BMW 3-Series, and has been developed with an uncompromising approach. 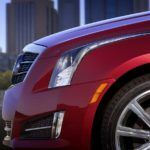 It is part of Cadillac’s “bookend” strategy for 2012, introducing products at the top (XTS) and bottom ends (ATS) of the market. While there is a lot of marketing hyperbole about new most products, with the ATS it really can’t be stressed enough about what it really means for Cadillac going forward. Keep reading on to see why. Cadillac = edgy. That pretty much sums up Cadillac’s ethos ever since it debuted its Art & Science design language on the original CTS in 2003. 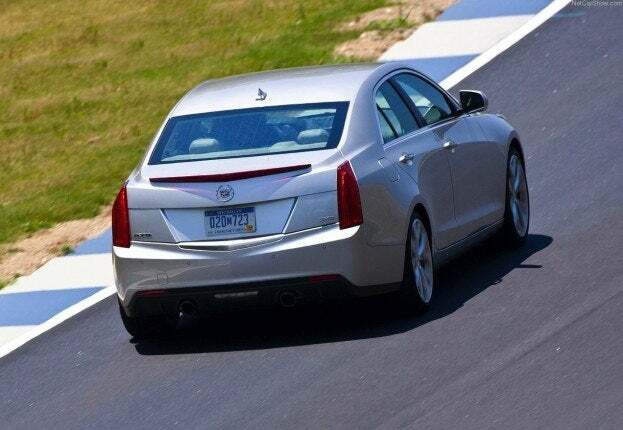 The most recent CTS, introduced in 2008, had even sharper and more defined creases in the sheet metal. The ATS, like the XTS that came before it, shows a more refined and mature take on A&S. Lines are a bit softer and more organic, while still remaining uniquely Cadillac. The ATS is a looker, although most agree could have been edgier. Cadillac chose to offer a very handsome design with traditional proportions, and the result works brilliantly. What’s under the skin is of more importance, however. Cadillac worked on the ATS project for two and half years before ever sketching out the design. ATS wasn’t a car built to a design proposal – it began with a set of objectives and the design was made to fit in around that. The ATS debuts an all-new platform for GM – Alpha. It is a scalable rear-wheel drive architecture that will underpin the next-generation CTS as well as other RWD products in the GM stable such as the Chevrolet Camaro. It was purpose built for performance in this application. To compete with the 3-Series requires nothing less than this kind of an effort. Size wise, the ATS is squarely in the compact category. Cadillac engineers wanted the car to be similar to the size of the E46 generation 3-Series. That goal enabled the ATS to be lightweight and nimble. Apparently the E46 3-Series was benchmarked for handling as well. A good majority of the ATS’ chassis development time was spent on the Nurburgring track in Germany. Its chassis affords it a 50/50 weight distribution, and the base ATS comes in at less than 3,400 pounds. Lightness was clearly a priority – engineers threw out outdated GM requirements and used aluminum, high-strength and ultra high-strength steel in key places to achieve this goal. The interior is an area where the ATS makes a mark. On a design basis the interior is best-in-segment in our opinion. 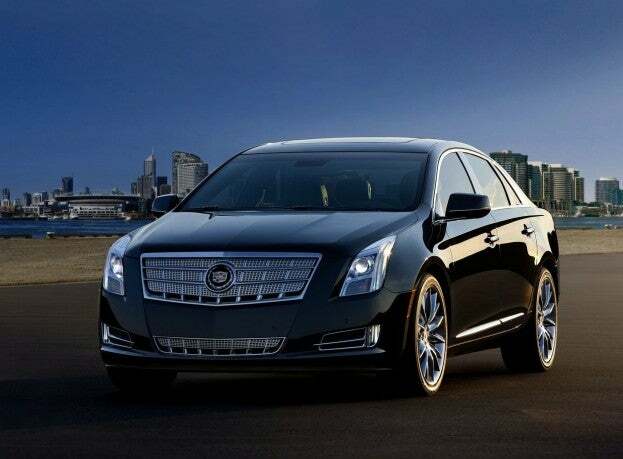 An extreme level of attention-to-detail is used, similar to the XTS that debuted in Los Angeles. Real-wood, stitching and a clean, upright center stack define the interior. CUE will be offered, bringing what most say is a class-leading infotainment system to Cadillac’s smallest sedan. For those who don’t want infotainment though, Cadillac will have a setup that ditches a center stack screen altogether. With this in mind, could the ATS be the purest sports sedan in the segment? If you so choose, you can opt for a lightweight ATS with rear-wheel drive, a six-manual and no infotainment system. Surprisingly enough, the ATS could end up being the purists choice. As for us? We’d take CUE – the ATS without a screen looks cheap. In fact, the switchgear looks right out of a Sonic. On upper end trim levels that isn’t the case. 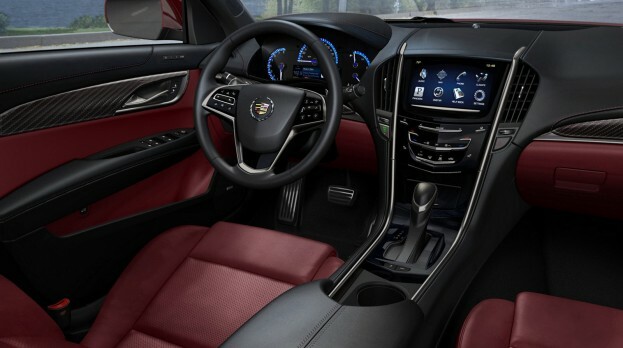 The ATS interior offers a variety of interior colors available, including red with a carbon fiber trim finish. At launch, the ATS will offer three engine options. When the V-8 powered V-Series arrives, that will swell to four. These engine options will run the whole gamut of what people are looking for in this segment. Like the rest, Cadillac ditches standard six-cylinder power for a naturally-aspirated 2.5-liter four-cylinder making 200 horsepower and 188 pound-feet of torque. This engine will enable the car to offer a low starting price and post attractive fuel economy figures. With a light curb weight, 200 hp should provide adequate performance for many. For instance, the E46 3-Series, which Cadillac likes to talk about as a benchmark, was similar in weight and power figures. For those looking for more, a 2.0-liter turbo four puts out 270 hp and a 3.6-liter six-cylinder ups the ante to 318 hp. The wealth of engine options indicates how aggressively Cadillac intends to compete with the ATS. The real question will be how it drives. The driving experience is the primary focus Cadillac put on this car. From what we can see in design and specifications, the ATS vaults to the top of its class, passing up the Audi A4, Infiniti G37 and Mercedes-Benz C-Class. Is it good enough to beat the BMW 3-Series though? The jury is out on that one, but the 3-Series might finally get a good run for the top spot. When everybody is clearing the bar, it’s time to raise it. In 2011, that is exactly what the National Highway Traffic Safety Administration (NHTSA) did. Manufacturers steadily improved and developed cars that would ace the tests. There is no doubt that the latest cars are safer than ever. Last year the NHTSA reports that traffic fatalities were down to record low levels. However, as long as there are any fatalities, there is room for improvement. 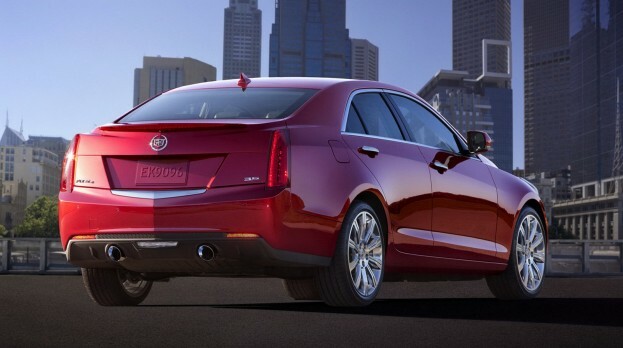 Some cars stand out from the pack – like the 2013 Cadillac ATS. The ATS is one of the most critically acclaimed cars of the year. Its attributes range from design inside and out, as well as performance and handling. Now it adds safety to the list. The NHTSA has announced that the ATS is the second car to receive a perfect score in every crash test category since the standards were changed in 2011. The first was another car made by General Motors, the Chevrolet Camaro. This is a significant win for Cadillac, adding another element for marketing. GM’s rear-wheel drive vehicles score particularly well in these tests. The BMW 3-series received near perfect scores in the test as well, save for a 4-star front impact. The 2013 Mercedes-Benz C-class hasn’t yet been tested. It is safe to say (no pun intended) that the ATS is one of the safest cars on the road. Not only in passive safety, but also active safety. The only two complaints with the ATS so far have been the base 4-cylinder engine and the fact that the 6-speed manual transmission isn’t available with the top-level V-6 engine. Both issues could be rectified easily in future updates. Right from the get-go the 2013 ATS is an automotive all-star and we are looking forward to spirited competition in the segment. 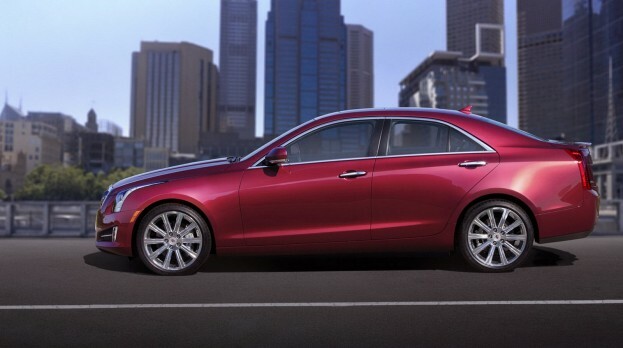 There’s no question – the 2013 Cadillac ATS is a big deal for Cadillac, General Motors and the automotive industry. The BMW 3-Series has been hunted down by the competition for years. There are longtime competitors like the Audi A4 and Mercedes-Benz C-Class as well as newer competition such as the Infiniti G.
They’re all good cars, but none have matched the 3-Series’ near-perfect blend of style, power and handling. Reviews are in on the 2013 ATS and nearly all are unanimous that is the strongest competition the 3-Series has ever received, coming extremely close to the segment leader. This has to be a worrying development for BMW, as the ATS is Cadillac’s first real attempt at going after the 3. The first CTS was pegged as a 3-Series competitor, but in reality it was larger and the 3 wasn’t benchmarked during its development. Adding further momentum for its launch, Esquire magazine has handed out the ATS its Car of the Year award. Esquire isn’t a magazine noted for its pull in the automotive world, and that’s part of award’s significance. Other awards were handed out to the Range Rover Evoque for SUV of the Year( we’ll agree with that) and BMW 640i Gran Coupe for luxury Car of the Year. Debut of the year went to the 2013 Scion FR-S and Subaru BRZ twins. The question about ATS until now has been about market acceptance – Cadillacs have had a stodgy image in the past. That has changed over the past decade, and the ATS could be coming at just the right time. Somewhere the guys at Caddy’s marketing department are cheering. Way to go guys. Automakers have always bragged about horsepower numbers, and still do. Thanks to high gas prices, the mileage wars have become extremely important as well. BMW made waves with the current 3-Series when it debuted, with its estimates promising 36 mpg highway. The Environmental Protection Agency later certified it at 33 mpg, an impressive figure for the 2.0-liter turbocharged four-cylinder sedan. 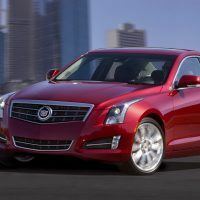 The 2013 Cadillac ATS is aimed right at the BMW 328i, and it comes with the availability of three powertrains at launch. The base model is a 2.5-liter naturally-aspirated four-cylinder making 202 horsepower and 190 pound feet of torque. Ticking the next option up nets you the 2.0-liter turbocharged four model making 270 hp and 260 lb-ft. The top-shelf ATS is motivated by General Motors’ 3.6-liter V-6 320 horsepower and 267 lb-ft of torque.The EPA has released figures for the 2.5-liter naturally-aspirated base model. At 22 city, 33 highway, it nearly matches the 3-Series’ figures. Great, right? Except for the fact that it is down significantly on power. The 3 series packs 240 horsepower while the ATS comes in at 202 hp. The 2.5-liter was expected by many to provide an eye catching MPG figure for the entire ATS line, beating the 3-Series. That hasn’t proven to be the case. The 3-Series is aided by its eight-speed automatic; the ATS comes with a six-speed unit. The ATS 2.0 is expected to be the sales leader of the lineup, offering a better value. Case in point? The 2.0 is projected to offer 22 city/32 highway. That’s just one mpg down in city and highway for 68 more hp. And, it has a price tag at parity with the 3-Series to boot, offering 30 more hp than the 328i. The ATS 2.0 is clearly the star of the lineup. At just $1,805 cheaper than the 2.0, we don’t think the ATS 2.5 will be long for this world. The story will be told soon enough by the car’s sales figures. 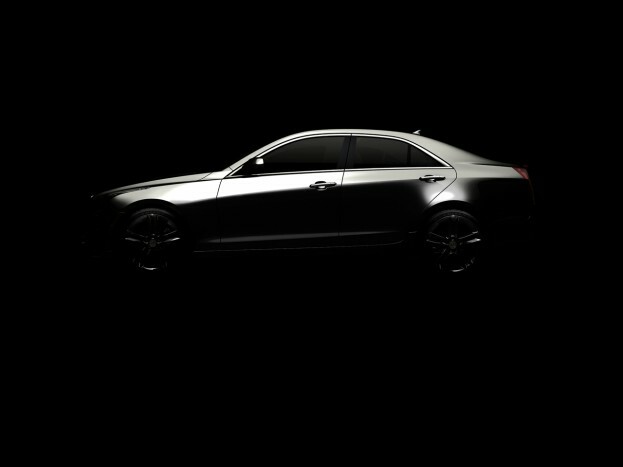 The launch of the 2013 Cadillac ATS is just around the corner. 2012 promises to be a big year for Cadillac. 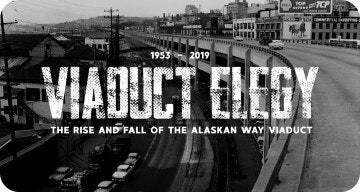 For the past few years it has been sorely in need of a fresh direction. 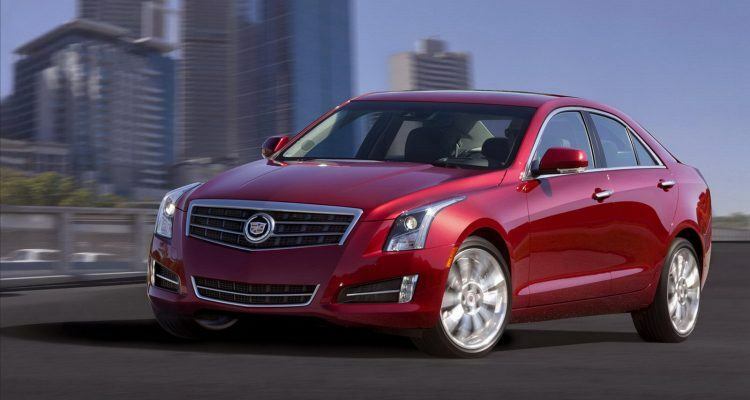 The CTS and SRX are the only truly competitive, volume vehicles in the lineup. The competition, on the other hand, has different segments of the market well covered. 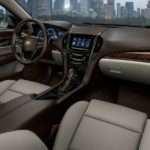 For 2012 that will begin to change somewhat, as Cadillac prepares to introduce what it calls its two “bookends” – the 2013 Cadillac XTS and ATS. The ATS is the volume model of the two, and the one we are looking forward to the most. That is because its rear-wheel drive. The Alpha platform that underpins it is an all-new architecture designed specifically for the ATS. 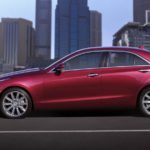 The CTS has been successful straddling the compact and mid-size sedan segments, but for the first time Cadillac will go straight for the BMW 3-Series. Cadillac has just announced pricing information for the ATS. The base model is powered by a 2.5-liter, 200 horsepower four-cylinder mated to a six-speed automatic. This option enables a low price of entry. During development Cadillac engineers have mentioned the E46 3-Series as a benchmark and these specifications put it on par with the 328i of that era. It starts at $33,990. Shelling out $1,805 will net you an extra 70 horsepower with the 2.0-liter four-cylinder model. Odds are the 2.0T will be the best-selling ATS model. Unlike the other two it is available with rear- and all-wheel drive, as well as automatic or manual transmissions. Those who want six-cylinder power can opt for the 320 horsepower, $42,090 3.6-liter V-6 model. 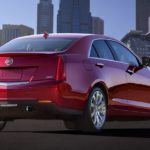 Cadillac is showing confidence with its pricing of the ATS, not attempting to undercut the 3-Series by a large margin. The 2.5-liter four-cylinder model comes in at about $910 less, but with 40 less horsepower. At $35,795 the 2.0-T commands about $895 more than the 328i, but offers 30 more hp. The ATS promises to be the stiffest challenge to the 3-Series yet. Let the competition begin. When you think of braking systems, Brembo usually comes up as a point of reference. The Italian company has clearly made a name for itself and penetrated into overall automotive culture. Brembo is a supplier to wide range of manufacturers, including performance and exotic makes like Aston Martin, Ferrari, Lamborghini, Pagani and Porsche. General Motors has worked with Brembo frequently on its latest offering. Brembo brakes are fitted on the Cadillac CTS-V lineup, Chevrolet Corvette ZR1, Camaro ZL1/SS and the Buick Regal GS. With an ever-expanding list of clients to tend to, Brembo has opened a new manufacturing facility in Homer, Michigan. Hooray for U.S manufacturing! 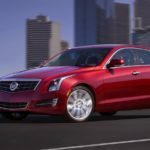 Brembo has announced that the first braking systems produced at the plant will be destined for the 2012 Cadillac ATS and XTS full-size sedan. These two cars are key to Cadillac’s future sales growth, occupying spots at the top and bottom of the lineup. For the ATS, which is taking it directly to the BMW 3-Series, performance credentials are a key part of the equation. The units are four-piston, two-piece calipers constructed from aluminum to save weight. Don’t expect the traditional red or yellow caliper coloring on the Cadillacs though. The ATS’ calipers will be painted in black, while the XTS will get anodized black. Bright colors should at least be an option on the ATS. We think that would enhance its sporting appeal and provide another dimension of color customization. Orange, yellow, red, black – it’d be pretty cool. But, we digress. Cadillac is clearly walking the talk with the ATS; it is serious about performance in every aspect. As if the CTS-V lineup wasn’t enough to prove they were serious already! The relentless focus on performance for the standard ATS has us looking forward to what is in store for the ATS-V. Bring it on! Rear-wheel drive Cadillacs! Those are the ones we like. 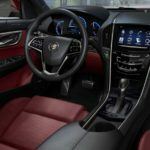 While the Cadillac XTS looks impressive, for enthusiasts the Cadillac ATS is the car to wait for. The 2013 ATS is our most anticipated (along with the 2013 Lincoln MKZ) debut at the North American International Auto Show. Regardless of whether it topples the BMW 3-Series (don’t bet on it), it’s great to see a new competitor on the block. 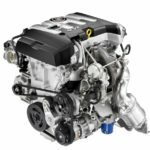 Cadillac has just announced more details about one of the ATS’ engine options, a 2.0-liter turbocharged four-cylinder. A four-cylinder Cadillac? Yes, times are changing. It is a move that presages a switch to the availability of four-cylinders in the segment. BMW is doing the same thing with the 3-Series. A few years ago we might not have been sure about it, but these cars are small and for those looking for good economy and power, a four-cylinder can do the job nicely. It isn’t as if they don’t generate impressive horsepower figures. Just make sure a V-6 is an option for those who want it. The 2.0-liter unit puts out an impressive 270 horsepower and 260 pound feet of torque, utilizing a twin-scoll turbocharger with 20 pounds of boost, direct injection, variable valve timing and an air-to-air intercooler. 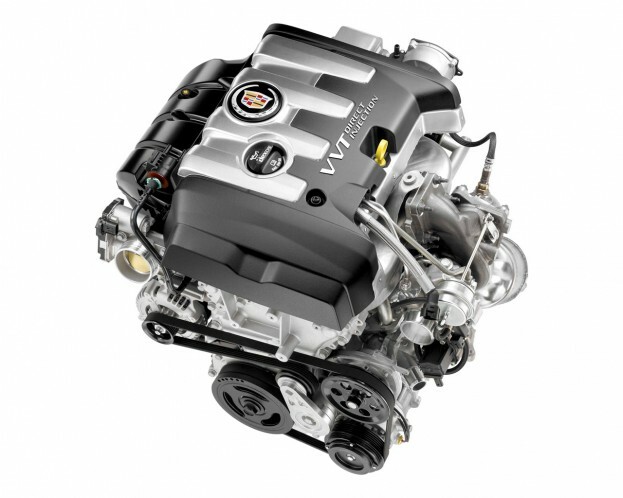 The engine makes 135 horsepower per liter, which Cadillac says is the best out of all its competitors. 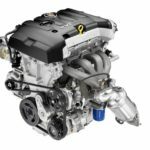 Other engine options in the ATS will include a 3.6-liter V-6 at the top end and a naturally-aspirated 2.5-liter four-cylinder as the base engine. No word yet on power outputs of either engine, and it appears the 2.5-liter may be an international-only offering. 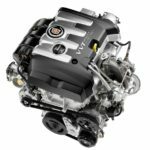 Take into account the upcoming V-8 powered V-Series and the ATS will be offered with a total of four engines spanning 4-, 6- and 8-cylinders. How is that for variety? The ATS can’t get here soon enough. 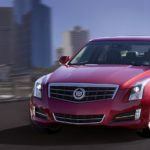 No Comments on "2013 Cadillac ATS Is New Frontier for Cadillac"